From Advent through Twelfth Night. Today is the first day of Advent – a time of anticipation, darkness and preparation. While we are shopping for the perfect gifts, baking the delicious cookies, cleaning and decorating the house, let us take time to truly prepare for the birth of the most perfect gift – Jesus Christ! Pray for those in your lives – and for our crazy world. Seek forgiveness for wrongs committed. 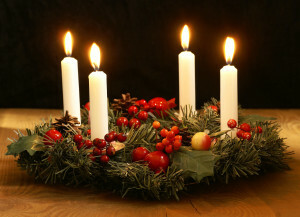 Light the Advent candles each week. Take some time to slow down. Take a break from the craziness of every day – just a few minutes each morning or with your family in the evening – think about how we see Jesus everyday and how we can bring Him to others every day. What are some of the traditions your family shares during Advent season? Share them in the comments!